On a visit to Tokyo with her family, Fusselman stumbles on Hanegi playpark, where children are sawing wood, hammering nails, stringing hammocks to trees, building open fires. When she returns to New York, her conceptions of space, risk, and fear are completely changed. Fusselman invites us along on her tightrope-walking expeditions with Philippe Petit and late night adventures with the Tokyo park-workers, showing that when we deprive ourselves, and our children, of the experience of taking risks in space, we make them less safe, not more so. 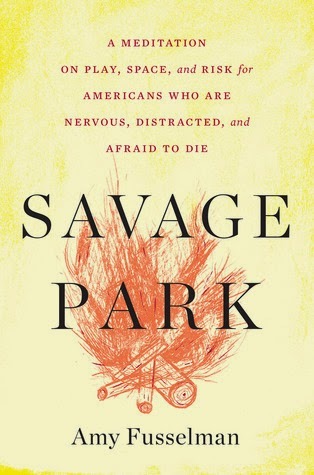 Savage Park is a fresh, poetic reconsideration of behaviors in our culture that — in the guise of protecting us — make us numb and encourage us to sleepwalk through our lives. We babyproof our homes; plug our ears to our devices while walking through the city. What would happen if we exposed ourselves, if — like the children at Hanegi park — we put ourselves in situations that require true vigilance? Readers of Rebecca Solnit and Cheryl Strayed will delight in the revelations in Savage Park. Very well written. I think Fusselman is an excellent essayist and she has a lot of great things to say about the nature of play, space and risk in relation to both children and adults. I like that she included both aspects and that the book wasn't just a meditation on over-parenting. The essays are all short and easy to follow although some are fairly philosophical in nature and do require the reader's full attention. As I mentioned above, some essays are more philosophical and therefore more difficult to read than others, but that doesn't mean they're less interesting. I do think, however, that this is going to have a somewhat limited appeal to the general reader. Unless you find the topic of play and risk and what it means to take up space of particular interest, you probably won't be as entertained by this as a reader who either has a topical interest or, like me, who just really enjoys a well-crafted essay. It's a great read and makes for either an afternoon of thoughtful reading or as something you can read an essay at a time. It's not something that will grab you and not let you go, but it is interesting and something that left me pondering what it really means to be safe and how to challenge my own fears.